Bohemian rabbi. 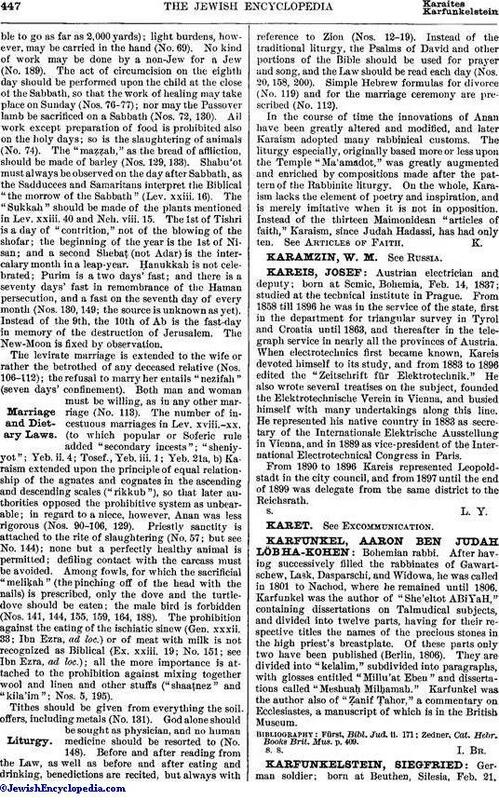 After having successively filled the rabbinates of Gawartschew, Lask, Dasparschi, and Widowa, he was called in 1801 to Nachod, where he remained until 1806. Karfunkel was the author of "She'eltot ABiYaH," containing dissertations on Talmudical subjects, and divided into twelve parts, having for their respective titles the names of the precious stones in the high priest's breastplate. Of these parts only two have been published (Berlin, 1806). They are divided into "kelalim," subdivided into paragraphs, with glosses entitled "Millu'at Eben" and dissertations called "Meshuaḥ Milḥamah." Karfunkel was the author also of "Ẓanif Ṭahor," a commentary on Ecclesiastes, a manuscript of which is in the British Museum. Zedner, Cat. Hebr. Books Brit. Mus. p. 409.